Consigned to 9/23/17 Hudson Valentine Sale - OCV - A truly elegant young female that is stacked in every way. Top Caliber has proven to be an extraordinary producer. Her dam is a huge framed cow that is upper 80's TTT and should push over 90" TTT in the next year or two. We are retaining a full and half-sister to her as well as her daughter and other close decedents. Dancing with Stars showcases where we are going with our programs and a true spotlight. She comes to you exposed to RJF Big Deal. Millennium Futurity Eligible. Consigned to 9/23/17 Hudson Valentine Sale - OCV - HR Rosebud and her family are something to build a program around. Her full sister is HR Slams Rose who sold for $80,000 as well as being the mother to Rebel HR and the grand dam to TCC Houdini. Rosebud’s full brothers are Rowdy HR and Big Red HR. We build around consistency and predictability here at Bentwood Ranch. We have retained an exceptional heifer off of her and CV Cowboy Casanova that allows us the opportunity to offer this phenomenal female for your consideration. She is exposed to RJF Big Deal. Millennium Futurity Eligible. CONSIGNED TO 2017 HUDSON-VALENTINE March Sale. OCV - Magic Osage EOT 029 is a fantastically well balanced female. Great color, milking ability, and great structure. Her sire is over 80" TTT son of Boomerang CP and goes back to the outstanding cow family JR Osage. This line of cattle did many wonderful things in the Bowman and Ron Jones breeding programs. The way she has been growing she has a shot at making 90" TTT. She should calve to JBR Eclipse in the spring of 2017. We are retaining an outstanding heifer out of her as a replacement. Millennium Futurity Eligible. CONSIGNED TO 2017 EDDIE WOOD COWTOWN CLASSIC January Sale. All of our Casanova calves are demanding top dollar coming off the ranch and JR Sassie has been the biggest cash cow producer on our ranch. She measured 65 ¼” TTT October 2016. She will have a calf by JBR Eclipse by sale date and will be exposed back to RJF Bowtex ( WS Jamakizm X WS Rainbow). Her first calf RJF High Yield is an exceptional individual sired by Archer Texa 290. We congratulate the winning bidder in advance on all the money you will make off of this “to be legendary” female. Millennium Futurity Eligible. eligible. Consigned to - 2017 EDDIE WOOD COWTOWN CLASSIC SALE - Jan 2017 - OCV- The pedigree on this heifer should make any longhorn enthusiast mouth water. This heifers sire is a 3/4 sister to Eternal Diamond. On the dam side her mother is mid 80's TTT and she is out of the mega producing K.C. Kiowa Queen. Wyoming Warpaint and Maximus ST have worked well together many times. She should have a calf at side by Sale date sired by JBR Net Worth. She will be exposed back to RJF Big Deal. 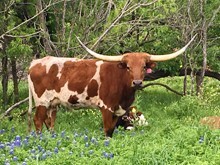 She tipped about 4 or 5 inches off of her horn this summer, but it doesn't affect her genetic package. Millennium Futurity Eligible. CONSIGNED TO - 2/25/17 TLBGCA Cattle Baron Sale - OCV - We have had huge success with LLL Maxamillion in our breeding program. He sired several daughters that are over and pushing 80" TTT. 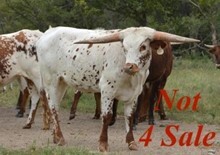 His full sister is Showtime Mona Lisa owned by Hoosier Longhorns has dominated in horn contests and futurities. On the dam side her mother is a half-sister to WS Jamakizm and Night Safari BL. She will be ready to the bull of your choice this spring. Strong Pedigree = Powerful Performance. Millennium Futurity Eligible. CONSIGNED TO - 2/25/17 TLBGCA Cattle Baron Sale - OCV - The Reflec Bar family takes time to get going on horn. Reflec Bar and Sheza Whip Er Wil have both made a permanent mark on the Bentwood Breeding program. RJF Super Dreamer just needs time to grow up and express herself and let her show you her full potential. She comes to you bred to JBR Eclipse. Millennium Futurity Eligible. CONSIGNED TO 2017 HUDSON-VALENTINE March Sale. OCV – This wonderful heifer is not only well bred but every animal in her pedigree is a wonderful producer. Her dam is pushing mid 80's TTT. 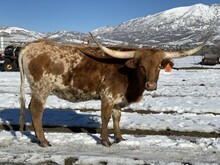 Allens 231 is out of Allens Doherty Peekabo one of the best producing cows on the McCombs Ranch. Peekabo is a full sister to Allens 83 that sold for 64,000. (178)'s full brother is pushing 80" TTT if not over at this point. We will have her exposed to JBR Net Worth (CV Cowboy Casanova x Eternal Diamond) for a fall calf 2017. Millennium Futurity Eligible. Consigned to 9/23/17 Hudson Valentine Sale - OCV - With great pride, we offer this extraordinary heifer that has more genetic potential than any animal ever offered for sale at public auction. 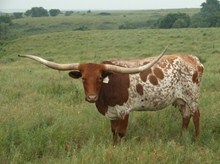 Her sire is the longest horned TTT and TH Sire in the world. Her dam is the largest TH cow in the breed measuring in at over 124" TTT and over 92" TTT. This exceptional mating opportunity is not a gamble as she has two full brothers that are pushing the measuring tape to be the best of their age groups ever, to go along with amazing color and stunning conformation. When you are striving to set your program apart from the rest you need an animal of this caliber in your herd. Millennium Futurity Eligible. Consigned to 9/23/17 Hudson Valentine Sale - OCV - Large framed daughter of the majestic Drag Iron. His daughters are smooth, clean, and has several daughters nearing in on 90" TTT with a wonderful twist. Here is where it gets exciting. HL Royal Rose’s mother is the $150,000 Royal Reputation. The magic that comes out of this extreme producer never ceases to amaze. HL Royal Rose has a half-sister that is 96" TTT with several other Reputation daughters in the 80's and pushing 90" TTT. We are retaining a knock out heifer off of HL Royal Rose and CV Cowboy Casanova. She is exposed to JBR Net Worth. Millennium Futurity Eligible. CONSIGNED TO MAY 2017 RED MCCOMBS FIESTA SALE - Big boned HCR daughter that is a great mother. She should measure over 80" TTT this spring at her next measurement. Doug Hunt told me that right now everyone is talking about HCR's sons and the impact they are making, but his Legacy will be in the production of his daughters. She is exposed JBR Net Worth for a fall 2017 calf. OCV. Millennium Futurity Eligible. Consigned to 2017 HCH Fall Sale - OCV - RJF Class Act is one of the most uniquely colored animals we have ever raised. The photo does not portray the brindle roan undertones. Her dam is a huge horned Peacemaker 44 daughter that has been a wonderful producer. We have Class Act exposed to M Arrow Mix Master. He brings Days Feisty Fannie, Working Woman, and Shadow Jubilee, Delta Van Horne, and ZD Delta Slicks Petite to the table. Talk about a game changer. Millennium Futurity eligible. CONSIGNED TO - 2/25/17 TLBGCA Cattle Baron Sale - OCV - Very promising young heifer. Lovely paint job with smooth lines and horns that are at 30" TTT @12 months. 9 out of 10 CV Cowboy Casanova daughters that have these measurements are high 50's TTT @ 24 months. Her dam is a full sister to Crafts SDR Rio's Sheeba who is nearing in on 80" TTT. This female line is a strong foundation female in several programs in Michigan. She will be ready to the bull of your choice this spring. Strong Pedigree = Powerful Performance. Millennium Futurity Eligible. Consigned to 9/23/17 Hudson Valentine Sale - DONATION LOT - Here is a beautiful heifer that is starting to roll over with an elegant twist. She has the femininity that you come to expect when looking at CV Cowboy Casanova daughters. Her dam is mid 80s tip-to-tip and sold at the Hudson Valentine sale last year for $17,000. She will come to you exposed to M Arrow Mix-Master who has two 90 inch TTT animals in his pedigree. Millennium Futurity Eligible. 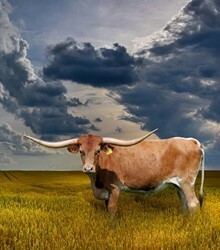 The money raised from the proceeds of this heifer will go to benefit the Texas Sentinels Foundation, Inc. Your generosity truly changes lives. Consigned to October Horn Showcase - OCV - It is hard to fault this extraordinary heifer. Her sire is a full brother to BL Rio Catchit and her maternal line is as dominant in the Bowman herd as the Tabasco Lezawe line. She is related to Tempting Rose PC343, Grand Osage PC, and many others making a huge impact for Debbie. Magic Spell is smooth, clean, and ready to breed to the bull of your choice. From March to June she has put on 8" TTT. Just think what she will be measuring in at on her second birthday. Millennium Futurity Eligible. CONSIGNED TO May MILLENNIUM FUTURITY - This is a heifer we really hate to let go of but we always strive to put something special in this sale. She should be mid to upper 50's TTT at 24 months and 60" TTT at sale time. We have sold several daughters out of her for big money with several of them pushing 80" TTT at a young age. 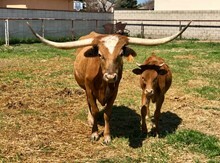 Hubbell’s Rio Linda is a type of female that works with any bull you put her with. Rio Rain has 5 animals in her pedigree over 80" TTT. She comes to you exposed to JBR Net Worth. This offspring should be extraordinary. OCV. Millennium Futurity Eligible. CONSIGNED TOMAY MILLENNIUM FUTURITY - RJF Super Gal is a large framed heifer with lots of color, size, and capacity. We were so blessed to get to use Archer Texa before he passed. The offspring off of this bull are extremely valuable. RJF Super Gal's dam is a half-sister to Crafts Rex's Red Rose, and under that you have our Reflec Bar line. This line of cattle can start slow but give them time and they will be the largest TTT animals in your pasture. Sells unexposed. OCV. Millennium Futurity Eligible.